A long time ago, I wrote an article on why owning a car isn’t necessarily a requirement. But I am all too aware that many of us live in cities where good public transportation isn’t as readily available, or we don’t live in cities at all. Not having a car is pretty much infeasible. So what are we to do if we still want to live simply and spend less, but need a reliable way to get around? This is a mistake. You will end up spending far more on the car (unless you practically never drive it, which defeats the purpose) than you should. On top of this, you will have absolutely nothing to show for your “investment” in the end. Your insurance costs will be astronomical, and even though you may be tempted with the low monthly payments, you just about always end up well into the red (compared to if you had just purchased the car outright.) Not to mention the mileage restrictions you will struggle to meet. This is a great article explaining more on why leasing is such a poor decision. Most importantly, it is a short-sighted decision. You are looking at the financial picture of a month, instead of in the long term. You are also looking at the ease of not being as responsible for the maintenance/repairs, rather that actually learning about how your vehicle works/how to maintain it yourself. Shirking responsibility is never a good thing. This is really an ego thing – let’s face it. A product of our culture. We always have to have the newest/biggest/best thing. Advertisers push new on us relentlessly. I have a confession to make – if you are driving a vehicle with custom rims/plates etc. I just shake my head. Why are you are enslaving yourself further by tying your ego to the kind of vehicle you drive? For every paint job you get to make your car look cooler, you are imprisoning yourself to your job that much longer. Remember my article a few days ago, about how you are not your job? Well, you are not your car, either! Buying a new car may seem cool, but you are really doing it because the idea of “new” seems better. You can save yourself tens of thousands of dollars by purchasing something used. A few months ago I moved from Oregon to New Mexico. I knew I’d need a vehicle in Las Cruces, because public transportation here just isn’t what it is in Portland. While it was hard for me to do (as most of you know, I travel light) I buckled down and bought a car. Did a ton of research, agonized over it for months, and debated. But I bought a used car – with 83,000 miles. It’s not flashy. It’s very small. But I pad for it ENTIRELY in cash. I own the car. No payments. No fees. No mileage restrictions. And it is the best car I ever owned – I love it. That is the real definition of ownership. If you buy something that you can afford – something that you can pay cash for straight up, you are in good shape. Monthly car payments are brutal for most people – it doesn’t matter if the payments are for a new car or a lease. Car payments will trap you, cut into your quality of life that can be spent on other things (or better, saved) and you’ll end up paying a heck of a lot more than if you had just saved up for something used. But New Cars Have it All! Q: But what about GPS? A: Get a map. A US Atlas is $9 at your local gas station. Q: What about gas mileage? 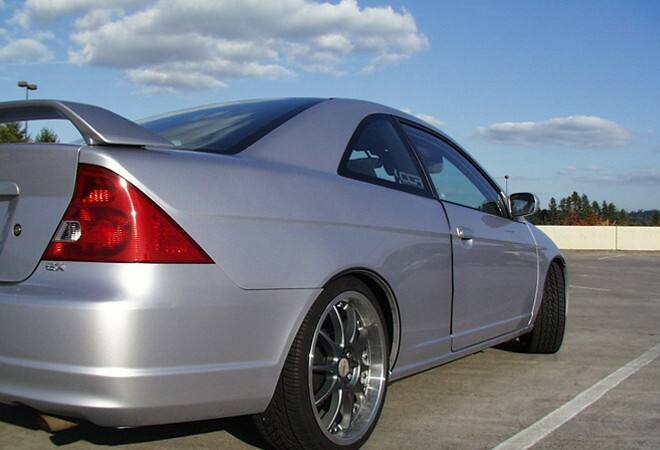 A: My Civic gets 40-45 miles to the gallon on highways. Most new cars don’t come close to that, except hybrids. Q: What if my co-workers laugh at me for having the parking-lot clunker? A: If you really want to escape your 9-to-5, you’ll get there a lot faster if you don’t buy a flashy new vehicle. Then you’ll be the one who is laughing. A car is something you purchase to get around from place to place. If you can’t afford one, you’ll need to find alternative ways to get around. Don’t borrow from your future so that you can look cool with your 2010 Prius that you won’t actually own until 2015. I’m amazed that people even lease cars still! It makes no logical sense to me that people do it.